Baba Slings- reviews from around the web. I can’t rate my Baba Sling highly enough! It just simply saved my sanity. I used it for all 3 of my babies and they all loved it as much as I did! "We love the hip and hammock carries. 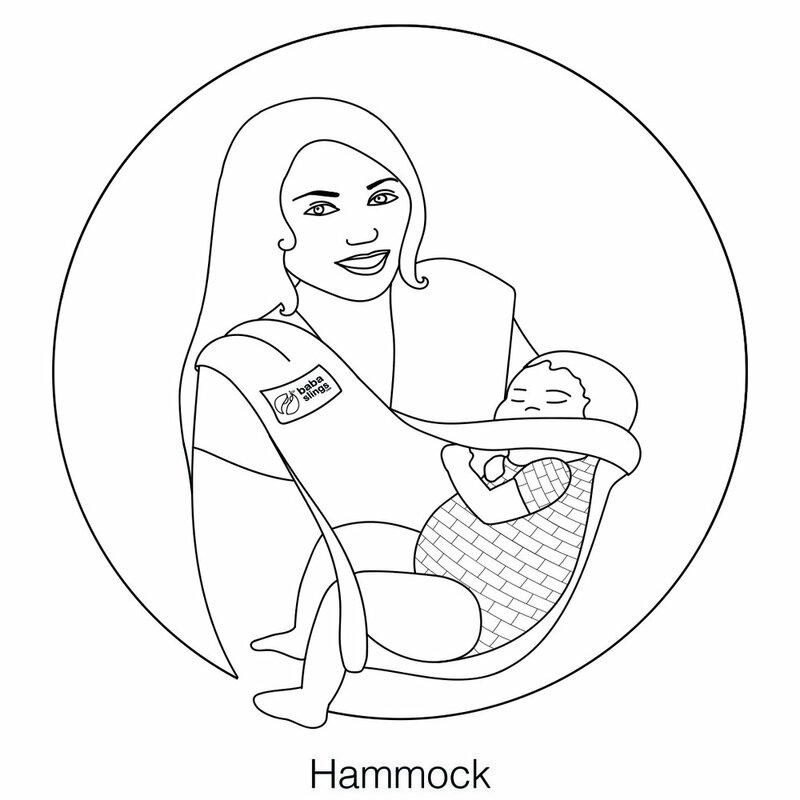 My daughter thinks that it is great that she can sleep across Mummy, and, because of it’s size, she is now back to sleep within minutes using the Hammock Carry. We had a sick toddler in the house, and, as a working Mum, I was fearful of what I was to do with a clingy baby and work demands. Then, my Baba Sling arrived. Problem solved! The Baba Sling fixed my dilemma in 5 minutes! My daughter loved being close to me again and was soothed almost immediately." "I am so excited. I got my Baba sling this morning and took it out for a spin this afternoon. I took my 2 year old to the park and carried my 5mth old son in the sling. It was fantastic. He hates the front pack we have so i have to always take the pram. Today i didnt get a protest out of him. He loved being in the Baba sling because he could sit up and see the world as well as feel like mummy was carrying him. It was so easy to use!!!! Awesome product. Thanks again. I love it!!!!" "Pros: This sling is everything we were hoping for and more. Our daughter settles almost instantly when we place her in the sling. She sleeps while we get jobs done! Here's what we like about the sling: * It really is hands free * Our daughter is safe and snug * Quick and easy to use, saves getting the pram out if the car at the shops * One size fits all - so both my husband and I can wear it * Good quality at a reasonable price * Australian made and owned * Bought online and arried the next day! Cons: It took us about a week to get confident using it, now that we've got it adjusted correctly though it's a breeze to use. Overall: One of our best baby buys! Our daughter is quite unsettled during the day, but when she's snuggled up close to us in the sling she sleeps soundly! For us, the Baba Sling is priceless"
I LOVE LOVE LOVE my (Baba) Sling. I got this because bub was very unsettled. The Baba Sling allowed me to carry my bub in a natural position, but I still had to get things done and play with my 2 year old. It’s great for quick trips, at the airport, wonderful at the beach and a MUST HAVE." "Well, Ava LOVED it! I walked down to the shops with her happily tucked up under my arm and head on my chest, she was even quietly content as I walked around the supermarket picking up the few things I needed, a task that usually vocal outbursts. It was great I had a quiet, happy child and two free hands"
"The babasling has been designed using a system of clips: the main clip joins the two ends of the carrier together and the second smaller clip allows adjustments to be made to tighten the fit. Of course, the fact that there are two clips which can be used for adjustment and that the second one is connected to the part of the sling that holds the child, indicates that the distribution of the fabric underneath the child is not limited in its ability to adjust the tension of the fabric fold, as is the case with a sling adjusted simply with the aid of two rings. So, everything is still great fun with my little baby of 22 months. The fabric is soft and cuddly, so a good form for the baby, which is important for correct positioning in the baby carrier. " "Baba Slings allow for 7 different comfortable positions to cater for your baby's changing moods and needs throughout the day. Carry from Birth up to 4 years. With discreet hands free breast feeding on the go, have the life you want and still be the best Mum that you know how. Great for Jet setters & public transport. Available in an amazing range of fabrics and styles including Organic"
A friend recommended the Baba Sling to me for use when travelling. Very useful for when there isn’t anywhere convenient to nurse. "I would highly recommend the BABA baby sling to any new parent. This sling is so comfortable and adaptable, my newborn took to it immediately and it was a godsend when she wouldn't stop crying or be put down. It has one simple clip at the shoulder that can be undone or very easy to take off over the head once bubs is finally asleep. I get stopped all the time when I'm carrying my baby in it to ask where did I get it from and 'what a fantastic idea'!" "Babyslings are fantastic, they really are. They are easy, fashionable, comfortable, safe and very practical. If you weren't convinced yet you should take a look at the big variety from Baba Slings. Recently I was lucky enough to try a Baba Sling myself. Instead of taking the double pram into the supermarket I put my son in the Itzy Ritzy trolley cover (the one you can win here) and my daughter in a gorgeous Baba Sling. Very easy and it takes a lot less room in the boot of the car! She just loved it and I got some jealous looks too." Have you used a Baba Sling before? Leave us a review!